South Gallia freshman Makayla Waugh (22) attempts to drive the lane against a Ohio Valley Christian defender during Thursday night’s girls varsity basketball game in Gallipolis, Ohio. GALLIPOLIS, Ohio — Consecutive games resulting in season sweeps. 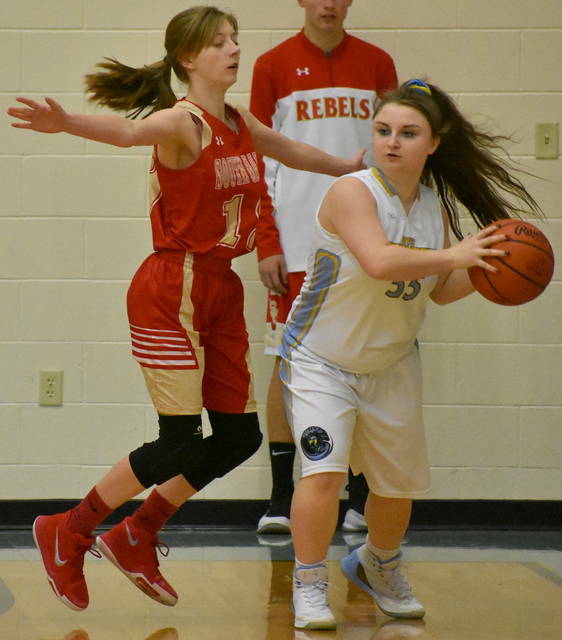 South Gallia held Ohio Valley Christian to just four points in the first quarter on Thursday night and never looked back during a 56-13 victory in a non-conference girls basketball contest between Gallia County programs. SGHS (5-9) led wire-to-wire as it held OVCS (2-11) without a field goal for the opening 2:40 of the first period. Both teams struggled from the field in the initial frame as the Lady Rebels made 5-0f-20 shot attempts, including a 0-of-2 performance from long range. The Blue and Gold made 2-of-8 shot attempts, as Emily Childers and Cori Hutchison each had a basket. South Gallia furthered its advantage in the second quarter as they made just 4-of-23 shot attempts for 17 percent. The visitors benefited from 11 first quarter turnovers as OVCS committed 30 giveaways in the first half. The Lady Defenders improved their offensive output in the second quarter, as they shot 1-of-7 from the field. OVC also gained production at the charity stripe by way of a 4-of-7 shooting performance. SGHS committed 11 turnovers in the first half and entered the locker room with a 22-10 lead. The Red and Gold outrebounded the Lady Defenders by a total of 23-16 prior to the game’s intermission. The Lady Defenders mustered just one point in the third quarter. OVC was held scoreless until the 2:06 mark when Hutchison hit a free throw to end a 16-0 run by South Gallia. The hosts again were plagued by mistakes as they committed 18 of their 54 turnovers in the third period. 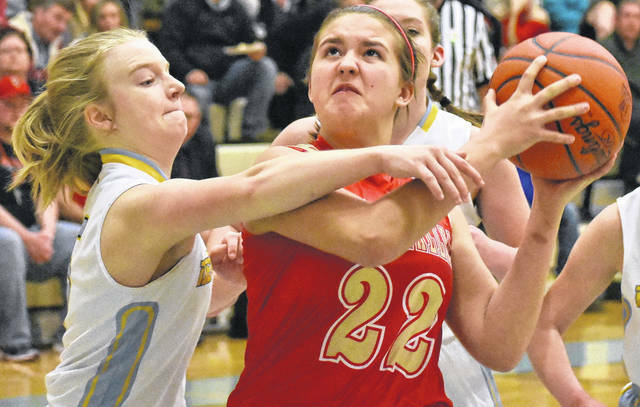 South Gallia carried the game’s momentum with a 14-2 run in the fourth quarter to close out a 43-point victory. South Gallia also earned a season sweep of the Lady Defenders with a 50-17 win on Dec. 29, 2017, in Mercerville. The Lady Rebels made 23 total field goals — including two trifectas — in the contest, as 10 different players scored. Aaliyah Howell and Olivia Hornsby led the charge with nine points apiece. Erin Evans and Amaya Howell were next with eight markers each. Kiley Stapleton followed with five points, including one trifecta. Makayla Waugh, Christine Griffith and Brooke Campbell each chipped in with four markers each. Gabby Spurlock and Katie Bowling concluded the scoring for SGHSwith three points and two markers, respectively. 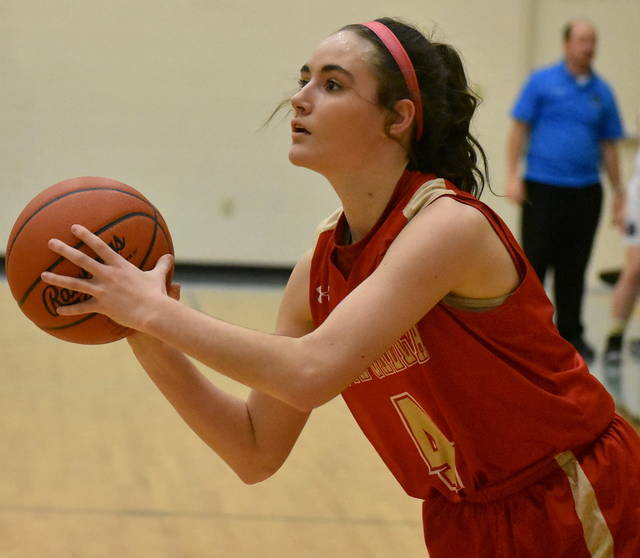 The Lady Defenders netted three total field goals and went 7-of-12 from the free throw line. Hutichison led the way with six points. Emily Childers was next with five markers, while Lalla Hurlow rounded out the scoring with two points.